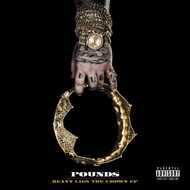 Pounds released his latest studio effort "Heavy Lies The Crown" in 2016. Anticipated by stand-out singles such as "Tributes", "Kill You" and "Coroner's Office", the Rochester, NY emcee unleashes a full-on verbal assault featuring top tier guests such as Westside Gunn, Conway The Machine, Chris Rivers, Clifton Haston, and productions by Fith, Spittzwell and Pounds himself. After touring with Drizzy Wright, Jackie Chain and Chris Webby and being crowned Rochester 103.9's "Battle Rap Champion", he can be considered a young vet in the game. Tuff Kong Records couldn't let this banger go without a vinyl release, so they're proud to bring you a selection of tracks from with the "Heavy Lies The Crown" EP. Featuring Westside Gunn, Conway The Machine, Chris Rivers, Clifton Haston, Jarren Benton & DJ Hoppa. 500 hand-numbered copies pressed, first 159 on gold vinyl and remaining 341 (this) on black vinyl.